Yes! Our batters are baked fresh from scratch using the most natural ingredients we can find. We only use our homemade buttercream and choose not to use fondant or gum paste so our products taste as good as they look. We never freeze our cupcakes or cakes; everything is baked fresh to order. Our standard size cupcakes are $2.50 each, vegan and gluten free cupcakes are $3.00 each, cheesecake cupcakes are $2.50 each, and jumbo filled cupcakes are $5.00 each. We offer mini cupcakes by special order only for $1.25 each ($1.50 for gluten free or vegan) with a minimum of 12 per flavor. Yes, by special order only. Mini cupcakes are $1.25 each ($1.50 for gluten free or vegan) with a minimum of 12 per flavor. Can every flavor be made in mini size? No. We can make most of our cupcake flavors in mini size, some with decor modifications, and some just have too much going on to be made smaller. Please see Mini Cupcakes for flavors available by special order. Do you offer jumbo cupcakes? Yes, several flavors of Jumbo Filled Cupcakes are available each week for $5 each based on the season and ingredients we have in stock. Other flavors can be special ordered with a minimum of 6 per flavor. Is there a minimum order for cupcakes? Walk-in retail customers can select any quantity of in stock cupcakes with no minimum. 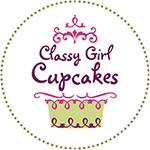 Special orders of standard size cupcakes, cheesecake cupcakes, and jumbo filled cupcakes have a minimum of 6 per flavor by special order. Mini cupcakes have a minimum of 12 per flavor. How do you box cupcakes? We package quantities of less than a dozen cupcakes in plastic snap containers, which keep your cupcakes fresher than boxes. Quantities of 12 and 24 are boxed in white boxes without inserts. Larger quantities are boxed in half sheet or full sheet cake boxes. Decorated cupcakes may be boxed with inserts or in molded plastic containers depending on quantity and design. Requests for individual boxes or boxing smaller quantities separately may incur extra charges. How should I store cupcakes? Cake cupcakes should NOT be refrigerated, as refrigeration dries them out. Most flavors will keep well at room temperature for a couple days in an airtight container such as our plastic snap containers or tupperware. Wrap larger boxes in plastic wrap or a clean kitchen trash bag, and keep them on your counter overnight. Can I freeze your cupcakes? Yes! Wrap the box in plastic wrap, and freeze up to 6 months. When you’re ready to enjoy your cupcakes, defrost the box in the refrigerator for 24 hours. Take it out and let it come to room temperature 2-3 hours before serving. Please note we cannot guarantee how the decoration or flavor will hold up in the freezer (as we don’t freeze cupcakes ourselves), but our customers tell us our cupcakes freeze well. Do you have a flavor schedule? No. If we did have a flavor schedule, it would change constantly because we allow customers to special order almost any flavor we make year round, and we sell the rest of special ordered batches in the bakery. There are 9 flavors we make every day: Carrot Cake, Confetti, Cookies & Cream, Ghirardelli Chocolate, Lemon, Peanut Butter Delight, Red Velvet, Vanilla, and Vanilla Salted Caramel. Other in stock flavors depend on the season, ingredients we have in stock, and what other customers special order. Do you make cheesecake cupcakes daily? Cathedral Square typically has 3-6 flavors of cheesecake cupcakes in stock daily, though we don’t guarantee the flavors. Flavors depend on the season, ingredients we have in stock, and what other customers special order. Brookfield Square only makes cheesecake cupcakes by special order with a minimum of 6 per flavor. We only use our homemade natural buttercream and cream cheese frosting. We do not use fondant, gum paste, or whipped frosting. Our cupcake buttercream has no shortening in it (with the exception of vegan frosting). Can I change the frosting color or flavor? Yes, there is no charge to change the color or flavor of the buttercream on special ordered cupcakes with a minimum of 6 per flavor/color. We don’t recommend dark or saturated colors, as they will stain teeth. Can I order black, red, or navy blue frosting on my cupcakes or cake? You can, but please note that dark or saturated colors will likely stain teeth, and could have a slight metallic taste due to the high level of food coloring. We recommend white, chocolate, or pastel colored buttercream, and saving darker colors for accents. Can I change the baking liners on my cupcakes? Yes, you can change the color of pleated or foil liner on special ordered standard size cupcakes free of charge, as long as we have your choice in stock. We typically have paper pleated liners in solid colors of the rainbow, neutrals, some pastels, animal prints, and polka dots. We stock foil liners in bright colors, pastel pink and blue, black, silver, gold, and rose gold. Tulip liners are an additional $.25 per cupcake and come in limited colors. Gluten free and vegan cupcakes can only be baked in foil liners, as they are more delicate recipes. Cheesecake cupcakes are only baked in 2oz. white paper souffle cups, as they are too heavy for standard baking liners. Can I change or add sprinkles on my cupcakes? Yes, there is no extra charge to change or add sprinkles to special ordered cupcakes, as long as we have your choice in stock. We stock many colors of jimmies, sanding sugar, crystal sugar, sugar pearls, and confetti sprinkles. How many cupcakes should I buy for a party? If cupcakes will be your only dessert, we recommend ordering 1.5-2 cupcakes per person if you want to offer multiple flavor choices. The more flavors you offer, the more your guests will tempted to sample more than one cupcake. If you want to purchase closer to one cupcake per person, we suggest ordering one flavor, or something simple like chocolate and vanilla in standard size. Mini cupcakes are a good bite for most people, so we suggest ordering 3-4 per person. Do you make gluten free cupcakes? Yes, both locations typically have 3-6 flavors of gluten free cupcakes on a daily basis, though we can’t guarantee which flavors we’ll have in stock. Many of our flavors can be made GF by special order with a minimum of 6 per flavor. You can find our list of flavors here. Click the pulldown menu labeled “Dietary Selection” on each product to see if that flavor is available gluten free. Our gluten free cupcakes substitute Glutino all purpose flour for wheat flour, which is primarily tapioca and rice flour based. Yes, both locations typically have 2-4 flavors of vegan cupcakes on a daily basis, though we can’t guarantee which flavors we’ll have in stock. Many of our flavors can be made vegan by special order with a minimum of 6 per flavor. You can find our list of flavors here. Click the pulldown menu labeled “Dietary Selection” on each product to see if that flavor is available vegan. Our vegan cupcakes substitute dairy and eggs for soy milk, vegetable oil or shortening (soy based), Earth Balance vegan margarine, and either Ener-G egg replacer or applesauce. Can you make egg free cupcakes? Yes, we can make egg free cupcakes that still contain dairy by special order with a minimum of 6 per flavor. Any flavor that can be made vegan can also be made egg free with dairy products. Can you make cupcakes that are both gluten free and vegan? Yes, if a flavor is available gluten free and vegan separately, we can usually bake it both vegan and gluten free at the same time, though we don’t recommend vanilla cake batters as they don’t turn out as well. The best choices for GFV cupcakes are banana, carrot cake, hummingbird (banana pineapple cake with walnuts), and almost any chocolate based flavor. Can you make soy free cupcakes? Most of our cupcakes contain either soy ingredients or sprinkles/decor. We can accommodate soy allergies in limited flavors with modified decor by special order with a minimum of 6 per flavor. Please note we cannot make our cupcakes both soy free and dairy free, as our dairy substitutes contain soy. I have a food allergy, can I eat your cupcakes? We do have peanuts, tree nuts, wheat, soy, egg, and dairy ingredients in our bakery. We take care to separate these ingredients and sanitize baking implements between uses. However, we do not have separate ovens for special dietary products, so we cannot 100% guarantee the environment will be free of allergens. Please note we cannot accommodate soy-dairy allergies, corn allergies, or sugar free requests at this time.